Wondering whether the Narendra Modi government has taken a sharp U turn to "ensure Babri mosque in Ayodhya and look secular", Vishwa Hindu Parishad chief Pravin Togadia has said that "those associated with the Ram Temple movement" as also "millions of Hindus" in India and abroad are of the view that "despite the full majority", the BJP government has not made "an inch of progress" to build Ram Temple on the disputed site. Accusing the Modi government of continuing to repeat that, as the Ram Temple case is in the court, it would "wait for the verdict”, Togadia, in a WhatsApp message, recalls that it is the same Modi in 1992 who rode with LK Advani on the rath starting at Somnath Temple "even when the case was still in the court". Calling the 1992 Ram Temple agitation "historical" with stalwarts like Ashok Singhal, AB Vajpayee, Sadhvi Ritambhara, Mahant Ramchandra, Mahant Avaidhyanath, Uma Bharati and many were present in Ayodhya, Togadia points to how then "Balasaheb Thakre and other Hindu organizations’ heads declared active support and sent their people to Ayodhya". "The dome fell. Many sacrificed their lives; many under the dome and many by bullets. Many families lost their young earners. Even then, the case was in the court and yet the Sangh Parivar got VHP and BJP to do the agitation of such a huge impact. 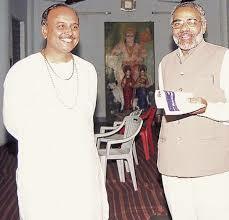 It was a culmination of years of Hindu awakening", Togadia, who is international general secretary of VHP, says. Pointing out that it was the impact of the 1992 Ram Temple agitation which ultimately got BJP in power, albeit with other parties, Togadia says, at that time "it was told to Hindus, waiting for a law on Ram Temple", that it could be come up "only when the party would have full majority... Up until 2004, BJP kept on promising the same. Justifying the 2002 riots in Gujarat, in which about 2000 people, mostly Muslims, died, Togadia says, this was the "common public reaction" following the burning alive of 56 Hindus returning from Kaar Seva at Ayodhya in Sabarmati Express in Gujarat’s Godhra, Togadia says, "They were among those millions of Hindus who kept on trusting the promise given by the BJP". 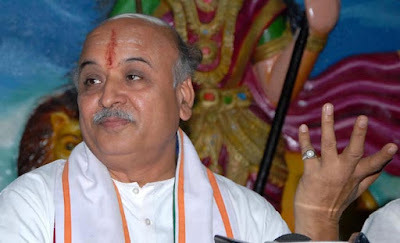 Regretting that "over 300 Hindus were shot dead by Gujarat police’s bullets in 2002", Togadia says, "That was the Government of the then chief minister Modi", noting, even then "Hindus waited for justice..." Today, he adds, the situation is such that "thousands of Hindus are rotting in various jails of Gujarat while cases on Jihadis in Kashmir are being withdrawn", and yet Lord Ram is "in a tent." Saying that it was "fine" for the BJP then for raising the issue of the law and Ram Temple for wanting Hindu votes, Togadia emphasises, "But now in power, betraying Hindus with such a sharp U turn, giving a meek excuse of a court case", the BJP is "using Hindus to get into power and then throwing them in the dust bean", insisting, it has only fooled "religious Hindus into voting." Taking issue with those who call him "anti-Modi", one reason why he is "raising such issues", Togadia says, he was a "good friend" of Modi for long, suggesting things have changed now. '"Betraying Hindus has become a fashion to look secular abroad and in New India", he underlines, adding, "Therefore, the demand is to fulfil the promise of the law on Ram Temple in Parliament without wasting any time or giving humbug excuses of the court case..."